Goffertstadion or De Goffert as it is often shortened to is the 12,500 capacity home ground of Nijmegen Eendracht Combinatie (N.E.C). First opened in July 1939 by the Prince of Netherlands, the stadium was rebuilt into a modern footballing arena at the turn of the millennium. The highest profile match played at Goffertstadion was undoubtedly the Cup Winners’ Cup match against FC Barcelona on 19th October 1983. Played out in front of a sell-out crowd, NEC narrowly lost 2-3 to their more esteemed Spanish visitors. Pictures of each stand to be uploaded soon. 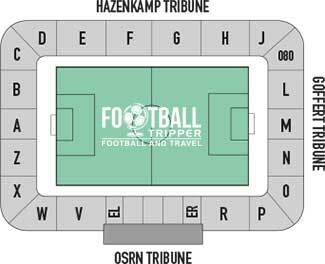 Away fans are housed within the south-east corner as marked on the above seating plan as section 080. If anyone has any additional information for away fans then please share in the comment section below! NEC’s club shop at Gofferstadion is located within the main stand and with the exception of the club’s online store is easily the best place to purchase official merchandise. Matchdays: 2 hours before kick-off, and 1 hour after the full time whistle. Note: It doesn’t appear to be open on weekends unless there is a match on! Stadium tours of De Goffert aren’t currently available but if this ever changes in the future we’ll be sure to update this section. Tickets to see N.E.C in action at home can either be purchased online (website is available in Dutch only) or in person from the ticket office in the days leading up to the match. Prices tend to vary depending on the level of opposition and where you sit however generally speaking tickets will set you back around €20.00 – €25.00 for a place behind the goal and anywhere between €30.00 – €50.00 for something central within the grandstands. For matches against the high profile opposition such as the famous big three, prices will increase by at least €10.00 per ticket. N.E.C’s stadium sits within the picturesque environs of Goffert Park approximately 3.8 km south of Nijmegen’s historic centre. The journey by foot will likely take you 40 minutes which is why some prefer to take the train instead. A view from the path leading to the main entrance of Gofferstadion. There are no car parks located within the immediate environs of the Goffert park which means you will likely have to leave your car in the nearby residential area and walk the distance. Remember to check the signs for parking restrictions! Goffert Park is served by its own train station known as “Nijmegen Goffert” which is around 10 minutes walk from the stadium. You can catch train services from Nijmegen Centre in the north and Nijmegen Dukenburg in the south making the ground accessible from around the city. Nijmegen Goffert station which overlooks the adjacent park is famous for its modern arched roof design. The closest international airport to Nijmegen is technically Eindhoven Airport 71 km away or Dusseldorf 111 km in Germany. Weeze Airport is also another option at 56 km away however it lacks the same number of flights as the aforementioned airports. With the exception of Sanadome hotel which is a luxury spa resort, the nearest hotel is undoubtedly Bastion Hotel Nijmegen which sit just the other side of Goffert train station. Back within the centre of Nijmegen there are numerous accommodation options to suit all budgets including Wilhelmina bed and breakfast, Amrâth Hotel Belvoi and Mercure Hotel which is metres from the central train station.